This innovative resource teaches you the critical thinking and assessment skills you need to build customized care plans based on each patient's unique needs. Its step-by-step approach guides you through the process, helping you formulate a nursing diagnosis based on known information and assessment findings; identify the appropriate nursing diagnosis; and create a care plan that includes desired outcomes, interventions, and evidence-based rationales. 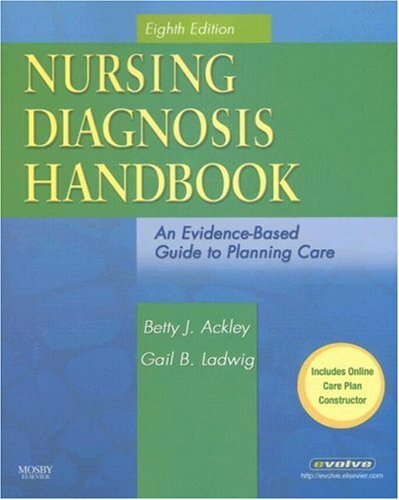 Nursing Diagnosis Handbook is an essential care planning resource you will turn to again and again throughout your nursing education and career. Provides care plans for every NANDA-I approved nursing diagnosis. Includes examples of and suggested NIC and NOC interventions and outcomes for each care plan. A convenient A-to-Z organization in Sections I and II helps you quickly locate key information. Evidence-based practice information is incorporated throughout. Includes complete coverage of pediatric, geriatric, and multicultural considerations, as well as home care and client/family teaching guidelines for each condition. A Care Plan Constructor on the Evolve website helps you create customized plans of care. Features the most up-to-date 2007-2008 NANDA-I approved nursing diagnoses, including approximately 15 new, 20 revised, and 5 replacement diagnoses. Provides a more detailed explanation of NIC and NOC taxonomies and their use in care planning. Explanations of assessment versus action interventions help guide you to the correct choice of intervention. Covers important information on concept mapping. Patient/Family Teaching sections offer expanded wellness and health promotion information. Clustered wellness nursing diagnoses are quick and easy to locate. Includes the latest evidence-based nursing rationales.